Several historical analogies have been advanced for the protests that have rocked Istanbul and other large Turkish cities over the past two weeks. Some commentators have been comparing them to the student unrest of 1968, others to the Arab Spring, and still others see them as part of a global wave of protests against the failures of liberal capitalism. Arguably, the ‘Taksim movement’ has certain similarities with all of these. Yet there is one parallel that most observers have largely ignored: the outbreak of protest in Russia following the rigged 2011 parliamentary elections. In both cases we see increasingly assertive, well-to-do and predominantly young sophisticated urbanites intent on challenging the specific notions of ‘democracy’ and ‘citizenship’ that authoritarian-minded leaders seek to impose on them. At the heart of the Turkish and Russian protests is the middle classes’ growing frustration with the governing style of the two leaders – Prime Minister Recep Tayyip Erdogan and President Vladimir Putin. While politically vague, the protest movements in Turkey and Russia are ultimately about establishing a more inclusive democracy that does not equate victory at the ballot box with the right to suppress political opponents. In both countries, mass street protests have their roots in a domestic political scene that lacks credible opposition parties – street action is the only way to make their voices heard. At the heart of the Turkish and Russian protests is the middle classes’ growing frustration with the governing style of the two leaders – Prime Minister Recep Tayyip Erdogan and President Vladimir Putin. The Turkish and Russian governments have responded to the protests in a strikingly similar way, claiming that the protests were masterminded by ‘foreign agents;’ accusing the participants of ‘anti-national’ behavior, and portraying them as marginal social groups. Both Erdogan and Putin have contrasted these ‘privileged’ and spoiled city dwellers with the ‘salt of the earth’ – the ‘silent majority’ living in the regions that constitutes their power base. The parallels between these protest movements can also be seen as part of a much larger picture. Russia and Turkey are both countries with an imperial past that have struggled to manage multi-ethnicity, and forge nation states. Their recent history has been similar in its rocky reform process – economic modernisation and political democratization; and the ways they have reacted to, and been perceived by, Europe. Turkey and Russia are often defined as countries that have been undergoing ‘catch up modernisation,’ but it is a modernisation that was imposed upon them, not one they embraced with enthusiasm. Turkey and Russia displayed, especially during the Kemalist and Communist phases of their respective development, the distinct patterns of an ‘alternative modernity,’ characterised by the primary role of the state, the weakness of the middle classes relative to the power of the state bureaucracy, the slow development of independent institutions, and the resultant feebleness of democratic structures. However, over the past decade, roughly coinciding with Justice and Development Party (AKP) rule in Turkey, and the Putin regime in Russia, the two countries appear to have been moving along diverging political trajectories. The 2002 electoral victory of Turkey’s ‘moderate Islamists’ can be seen as a result of the powerful processes that are reshaping the socio-political life of the country: spectacular economic development in the Anatolian hinterland; the broadening base of an elite group through the emergence of new ambitious provincial players, who are economically dynamic and culturally conservative; and the increasing role of elected officials. In contrast, Russia’s development has been generally characterised by the rise of state control over the economy and the ‘rollback of democracy’. Yet the differences may be less dramatic than it might seem at first glance. 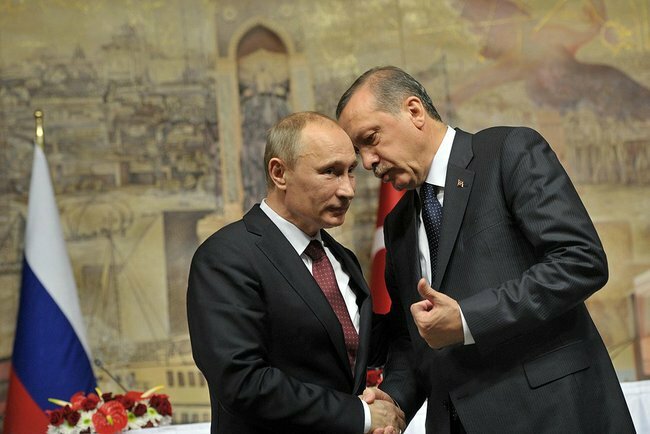 There is no question that Erdogan’s Turkey is more democratic than Putin’s Russia, but in both countries democracy is not yet deep-rooted. The AKP, as some Turkish commentators note, is a ‘democratising force’ but not necessarily a ‘democratic’ one. Other observers argue that Turkey is becoming more authoritarian, pointing out Erdogan’s alleged fascination with Putin’s policies; and some Turkish commentators even talk about the ‘Putinisation’ of Turkey, seeing this as a greater risk to democracy than Islamisation. Turkey and Russia belong, of course, to different religious traditions: Turkey is overwhelmingly Muslim; Russia has an Orthodox Christian majority. In both countries this has sparked a debate on how a nation’s religion can be reconciled with the desire to modernise. Some Turkish and Russian intellectuals argue that the Western path of secular modernisation should not be seen as the only option, but that their countries’ evolution can and should reflect the religious underpinning of their society. In Turkey, there is much talk of the rise of ‘Islamic Calvinists’ in Anatolia’s economically booming urban centres, whereas in Russia, the United Russia party has argued that Orthodoxy constitutes a ‘spiritual foundation’ of the country’s modernisation. How that view can be squared with the many who do not have strong religious beliefs is another question. It is difficult to overestimate the significance of their imperial past, for both Turkey and Russia. But while post-Soviet Russia has claimed historical continuity with the Soviet Union and clung to the coveted status of a great power, Turkey’s ‘Ottoman infatuation’ is a relatively recent affair. Reconnecting with Turkey’s Ottoman past began during the Turgut Özal years in the 1980s, but so-called ‘neo-Ottomanism’ has flourished in earnest only since 2002, when the AKP’s came to power. Both countries’ elites insist that their strategy does not involve a restoration of empire, but they are also quick to point out that Russia and Turkey are not ‘ordinary nation-states,’ and like to talk about their regional ‘primacy’ or ‘privileged’ interests in their strategic environment. Policymakers in both countries also regard themselves as being not just politically but also morally responsible for what is happening in their former imperial borderlands, and the task of reintegrating their immediate neighbourhoods appears high on the two countries’ agenda. Ideas about a ‘greater Russia’ or Putin’s beloved ‘Eurasian Union;’ and of the historical ‘Ottoman sphere’ reflect the persistence of imperial ideology in both countries. Nationalism is the adopted son of this imperial heritage; excessively proud and at times even prickly, particularly when they think they are not being treated with due respect, or taken for granted. Exaggerated national pride, and resentment of the West are sentiments shared by Turkish and Russian policy elites. Ideas about a ‘greater Russia’ or Putin’s beloved ‘Eurasian Union;’ and of the historical ‘Ottoman sphere’ reflect the persistence of imperial ideology in both countries. Students of empire know that the process of post-imperial readjustment, whereby the old centre disconnects from its former dependencies and seeks new ways to reconnect with them as neighbours and partners, is not always a smooth process; the British Empire is an example. Throughout most of its republican period, Turkey has been geopolitically isolated in its immediate strategic environment (which made its membership of NATO a particularly valuable asset), while Russia’s attempts to integrate its post-imperial space have so far been unsuccessful. Significantly, over the past decade, Turkey and Russia appear to have been resorting to different strategies in their respective neighbourhoods, including their shared neighbourhood in the Black Sea and Caspian region: Ankara relies mostly on its soft power, while Moscow alternates between cajoling and bullying in its post-Soviet backyard. In land-based empires, with their blurred borders between the national ‘core area’ and the periphery, an overarching imperial identity impedes the development of ethnic- or civic-based nationalism, and the emergence of a nation-state. In both Turkey and Russia the process of nation-building has remained incomplete, as the very notions of ‘Turkishness’ and ‘Russianness’ are argued over constantly, and there is no consensus agreement yet as to what it means to be Turkish or Russian. In both countries, where memories of the imperial collapse are not only still vivid but are deliberately cultivated by the ruling elites, the concept of national unity is largely understood as state unity, which is taken to mean territorial integrity; and all separatist forces are ruthlessly suppressed. Strange as it might seem, but this fixation on state unity and national sovereignty arguably makes Russia and Turkey, in the words of EU theorist Robert Cooper, the most ‘modern’ states in Europe. Unlike the ‘post-modern’ EU countries, which delegate powers both upwards and downwards, Ankara and Moscow put a special premium on state nationalism, centralisation and sovereignty. Clearly, such ‘modernism’ makes it hard for Turkey and Russia to integrate with the EU. Yet there is also an interesting paradox. The AKP leadership (unlike its Kemalist opponents) and the Putin Kremlin seem to be wary of the Western concept of the nation-state and of ethnic nationalism; and are in general very sceptical about whether these ideas could help them consolidate their ethnically and culturally diverse societies. They would rather integrate key parts of their former imperial sphere around the new imperial ‘core,’ and form some supra-national entity. Yet, when it comes drafting their integrationist schemes, both Russian and Turkish ideologues invoke the European Union model. This brings us to one of the most important parallels between Turkey and Russia – namely, both countries’ position in respect to Europe. Historically, these two Eurasian powers on the periphery of Europe were perceived as Europe’s significant ‘others.’ To be sure, there is one notable difference: unlike Russia, which likes to consider itself equal to the EU as a whole, Turkey has become an EU candidate country, and started negotiating for EU accession. But this difference is in the process of erosion: firstly, some EU leaders are having second thoughts about Turkey’s membership, and instead advocating the alternative of a ‘privileged partnership;’ secondly, if the Cyprus talks come to naught, Turkey’s EU negotiations will stall indefinitely. This will effectively leave Turkey and Russia basically on the same page, as Ankara would probably have to look for forms of association with the EU other than full membership. This, however, could be seen as an opportunity. Both Turkey and Russia are uncertain about their European identity, as their heated domestic debates illustrate so well. In both countries there is no consensus as to what it means to be European, which potentially opens up the way for Moscow and Ankara to cooperate in redefining the meaning of Europe.